Narkomfin 2037 | gURROO - A new generation of innovative minds. 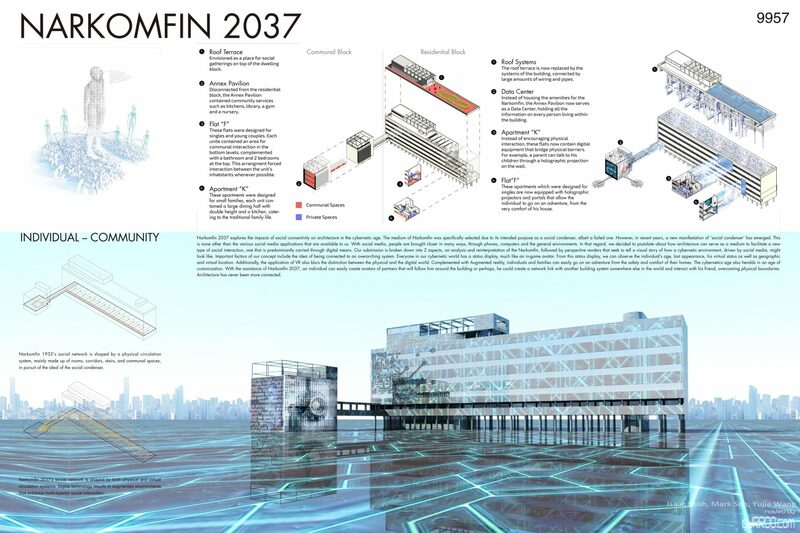 Narkomfin 2037 explores the impacts of social connectivity on architecture in the cybernetic age. The medium of Narkomfin was specifically selected due to its intended purpose as a social condenser, albeit a failed one. However, in recent years, a new manifestation of ‘social condenser’ has emerged. This is none other than the various social media applications that are available to us. With social media, people are brought closer in many ways: through phones, computers, and increasingly digitized environments. 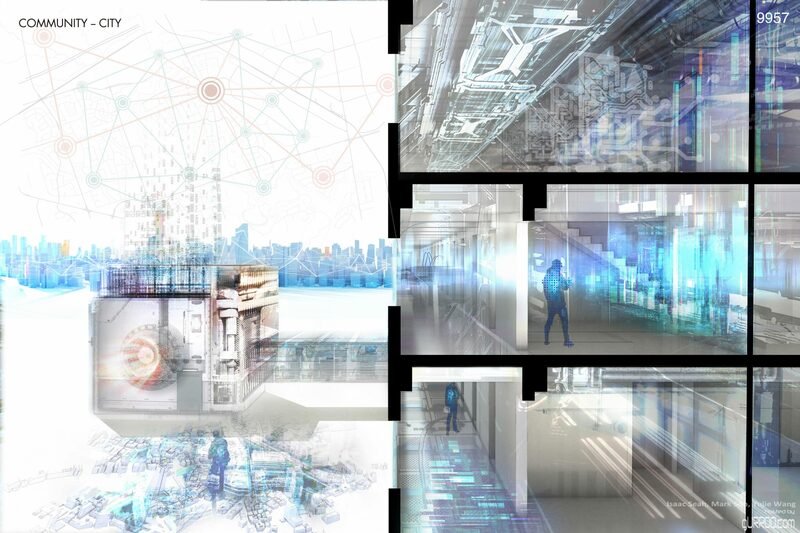 In that regard, we decided to postulate about how architecture can serve as a medium to facilitate a new type of social interaction, one that is predominantly carried through digital means. Our submission is broken down into 2 aspects- an analysis and reinterpretation of the Narkomfin, followed by perspective renders that seek to tell a visual story of how a cybernetic environment driven by social media might look like. Important factors of our concept include the idea of being connected to an overarching system. Everyone in our cybernetic world has a status display, much like an in-game avatar. From this status display, we can observe the individual’s age, last appearance, his virtual status as well as geographic and virtual location. Additionally, the application of VR also blurs the distinction between the physical and the digital world. Complemented with Augmented reality, individuals and families can easily go on an adventure from the safety and comfort of their homes. The cybernetics age also heralds in an age of customization. 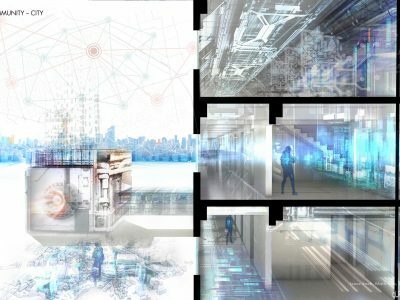 With the assistance of Narkomfin 2037, an individual can easily create avatars of partners that will follow him around the building or perhaps, they could create a network link with another building system somewhere else in the world and interact with his friend, overcoming physical boundaries. Architecture has never been more connected.